On April Fools day, Dice.com showed the world their then latest search page redesign. I didn't like it. At all. You can read about all of the changes here. In the intervening week, someone, actually two people in Urbandale, Iowa hit my blog and read the article. There were more hits in the last few days. So I know that Dice is listening and for the most part agreed for now. After all this is whining I am doing considered "real" work. It's called "User Interface/User Experience" and that's going on my resume since this is the third time that I've had an effect on a website because of a blog article I wrote. Not tooting my own horn, but hey if you've got it, flaunt it, right? Location Options Zip Code: 33301 (for Wilton Manors, Florida) and Include Jobs within: 20 miles. Exclude: Entire Job Detail the word "Sales"
1) this could be because of Firefox or that I'm not awake but the Zip Code Field did not clear when I typed the first 3 in it. 2) Results Displayed. I'm in a Major Metropolitan Area. I want either "1000" or "all". My results on this search should be around 500 jobs. It was in the other search that I did... on the other hand it only returned 32 jobs. Ok, so what did I do wrong? I know that in this area there are more people looking to hire now than there were six months ago. 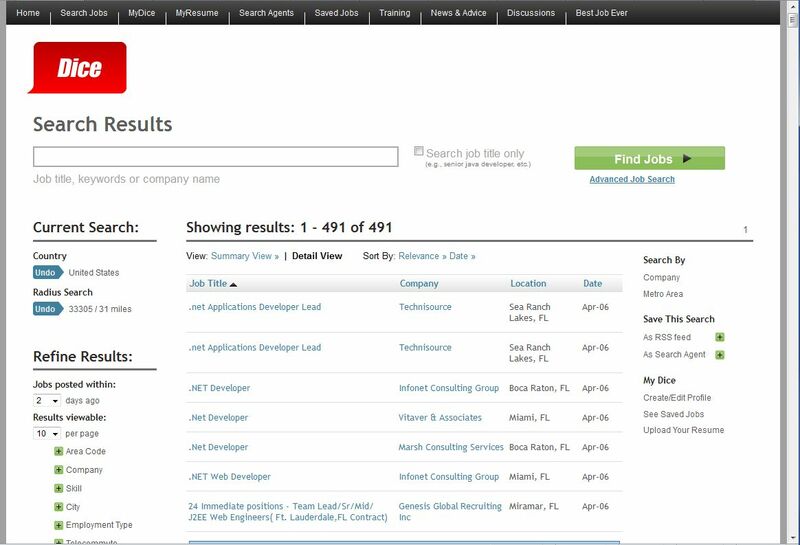 Went back into the advanced search and removed from the "Exclude" box the word "Sales" and amazingly I got 3644 positions... Hmmmmm Not Quite Right. After playing around it turns out that it was the zip code and distance that was holding me back. Going from 3644 jobs to 15 was ... jarring. This is all a part of getting the search "just right", and takes some time to finesse the website and the data so it's "Perfect". It may actually be completely correct since I tend to aggregate my Project Manager search with other things that are similar. My Mileage Did Vary. Assuming that I want to look for every position that Dice knows about for Project Manager in the US, excluding "sales" anywhere in the body, it goes down to 3080 positions. Clearly I have work to refine this query. I have no problem with this ... or do I.
I still want my "All" but realistically since I do this every day, I don't want to look at 3080 positions. My biggest Dice Search today yielded the picture you see above. 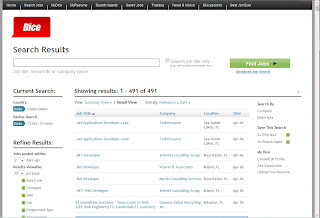 Ok, so it's from yesterday afternoon, but it does have 491 positions. The point I am making is that I should be able to save the search as is and as a link, and have it remain. I can do both, but if I do by the web page, I have to save each page as a link. With 491 positions, I will have to save 10 pages plus 1 for "growth". That is how I work Careerbuilder - I couldn't figure out how to break that one up properly using an "All". The time for "All" is when you are happy with the breadth of your result and want to save your search. I just drag the link into my bookmarks for "Open All In Tabs" and have all my searches open up semi-automatically. Leaving "All" alone for now, there's a problem that I spotted with the search results. This is why I said it's "Getting Better", you can't re-sort everything on the page. While I can sort by Location or Date, I should be able to further break down the search by saying "everything in Fort Lauderdale". That will exclude the neighboring cities of Wilton Manors or Oakland Park, but this would be a "Special Search". I guess it isn't a major problem since I can specify it in the Advanced Search instead of a zip code. The point is that it seems missing - more of an annoyance than a must have. I still want my "All" though... or "1000". The nice thing is that Dice does put this long string in your Address Bar that you can save. Most websites that use Ajax technologies (Don't worry I won't geek out on you here non technical readers) wipe out the URL web address and replace it with that of the home page. Here it would be http://www.dice.com and you'd be forced to use the RSS reader to do what I'm doing. Not a good idea since the RSS readers are meant to be simple, and I haven't found an easy way to configure that whole kettle of fish. Make mine with chips and a side of Guinness please. So for now, and for the last couple years, Dice has been easy to use that way... and I hit it within my 160 pages that I load daily and 320 on the weekend. For now, I won't give instructions on how to reconfigure (or hack) the resulting URL. I think that with what you have here, you can get your results configured how you like. Even configured how *I* Like, and I'll admit I'm a demanding user. On the other hand there are some issues with how the display of the data is done, and this posting has gone on for 1038 words. Check back Monday for more.